Woking's new track-focused hypercar makes its dynamic debut at Goodwood. The Senna was already about as extreme a performance machine as McLaren had ever made – this side of a purpose-built racing car, at any rate. But the Senna GTR takes it even further... and it just made its dynamic debut this past weekend at Goodwood. 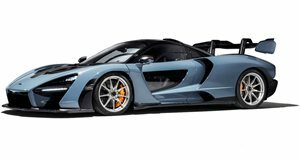 First unveiled in stasis at the 2019 Geneva Motor Show just last month, the McLaren Senna GTR takes the road-going version into even more extreme territory by amping up the engine, cutting excess weight, adding more downforce, and tightening everything up all around for the track. By recalibrating the software and removing the secondary catalyst, McLaren has augmented the 4.0-liter twin-turbo V8 from 789 horsepower to 814 (backed by the same 590 lb-ft of torque). The side exhausts from the concept shown last year have been relocated back to the same position as the road version's, exiting just under a much larger rear wing that helps generate over 2,200 pounds of downforce at 155 mph – a significant increase over the road car's ~1,760 lbs. The whole thing weighs less than 2,620 lbs, giving it a power-to-weight ratio of 694 metric horsepower per ton. The suspension is borrowed from the 720S GT3 racer, with brakes even bigger, and slick tires mounted to center-lock alloys keep it all planted to the tarmac. And the interior's been stripped out to near racing standards. Unfortunately you can't drive it on the road, but that's all entirely academic since all 75 examples to be made have long since sold out. The closest you may get, then, is to watch the Senna GTR make its on-track debut at the 77th Goodwood Members' Meeting, where Bruno Senna drove it around the storied circuit together with a smattering of other extreme McLarens.